Do you Long to Be Part of The Cool Group? | Life Love and Hiccups: Do you Long to Be Part of The Cool Group? The other day I was listening as my seven year old son chatted to a friend about this Cool Kid and how he belonged to the Cool Group at school and I thought to myself at seven there is a Cool Group at school? Really? I asked them, why is this kid so cool and they told me it was because he was really good at EVERYTHING he does and he has heaps of friends. I thought about that for a moment and then I asked them "is he nice?" "Yeah he's like realllly nice" they answered with enthusiasm. "Ok then what about his friends, The Cool Group, what makes them so cool?" I enquired. There was silence for a moment as they thought about this and they threw in a couple of things like "Well such and such is good at skateboarding" and "such and and such is really smart" ...... and then they stopped. They stopped because they couldn't really identify what made the rest of the Cool Group so cool. "Ahhhh so are they cool by association?" I said out loud. And so with those words I opened the can of worms and I had no choice but to dig in to that can as those kids sat and waited for me to go on with what I had started. Everywhere you go in life, you are going to be surrounded by Cool people and Cool Groups. They are at school - even primary school it seems. They are at uni, at work, they are standing in a group outside school waiting to pick up their kids, they are hanging at the beach or the local mall and they may even be chilling out on twitter. When I was at school I can remember there was a cool group and there were some really nice people in that group ...... and there were definitely some real tools too. I recall one time when just like a cheesy American teen movie, a friend of mine was plucked from the general population by a cool girl and officially initiated into the Cool Group. She became cool by association (though she was a really sweet girl, so totally cool in her own rights) and we all watched on in awe as her fairytale begun. I have never been overly fazed by the Cool Group thing. We all know I wear my emotions too loudly to ever pull off the Cool demeanor. In my lifetime (even throughout school) I have never really wanted to be tied down to one group of friends, I prefer to flit around enjoying the company of as many as I can. I have my besties whom I adore and are always my homebase but I really love to get to know other people, cause I like people, well most people - some are just assholes and I'm not overly fussed on them. I am attracted to people for so many different reasons, some of which are probably really uncool traits in coolness terms, but they make me laugh or feel good and that totally reeks of coolness from my point of view. Someone with a talent or intelligence but who is humble and gracious and puts that talent and smarts to good use. Someone who is kind, with a good heart and makes people feel welcome and comfortable. Someone who has conviction and is brave enough to stand up for what they believe in and is not afraid of going against the grain. Someone who wears their personality with pride and doesn't feel the need to accessorize it with the latest coolest gear. Someone who enjoys something passionately, be it music, food or a hobby, because they have a genuine passion for it, not because it is considered cool or en vogue. Someone who not only cares for themselves but genuinely cares for others, quietly, without the need for recognition and accolades. Someone who shares their good fortune or success - they don't stare guard over it and growl at anyone who dares to want a taste. By this point, the boys eyes had glazed over and they were itching to be given the nod of freedom to go back out and ride their skateboards. After they left me, I poured myself a cuppa and kept pondering on this idea of being Cool or Not and I found myself thinking about all the uncool behaviour I have witnessed in my lifetime by some of those who run within a Cool Group. The interesting thing is I haven't seen these behaviours come from the genuinely Cool, they have been displayed by the Cool by Association type, the ring ins, the Wannabes. Those who feel the desperate need to stand with the cool group to validate themselves in some way or another. I have seen them belittle others in an attempt to make themselves look better in the eyes of their cool peers or role models. I have seen old friends abandoned in favour of someone cooler with more street cred. I have seen people lose their identity in an attempt to recreate a cooler version of themselves. I have seen people greedily accept the rewards that sometimes come with being associated with truly Cool people, and they have gobbled that reward up, hungry for more but never stopping to appreciate and be grateful for their gains like a really cool person would. Truly cool people, may not even realise they are cool, they just go about their life, whilst the wannabes flaunt their association in the hope it will bring respect from those around them. I believe every society needs a truly cool leader. In fact every animal group needs a leader, someone to inspire us, to guide us, to lead by example, to be brave enough to pave a way forward for everyone else. But that coolness comes with a responsibility too and only the truly cool would be aware of this. So do I want to be friends with a Cool Person? Of course I do! I'm just like everyone else in that I like to have friends and I like friends that inspire me. Do I desire to hang out in a Cool Group and be cool by association? Nah ah! I aspire to be cool in my own right, to earn that coolness through my own good actions. I want to be truly Cool, not just part of a Cool Group. Something must have sunk in with my talk to my son as he came home yesterday from soccer practice and told me he belonged to the Coolest Soccer team ever. "Oh really" I said, "and what makes you guys so cool?" "Because everyone is really nice and we all help each other and make each other feel good and we have fun together". Yep you've figured it out Sammy, at seven years old, you've got it sussed and to me that makes you one of the Coolest seven year olds around and for that I am am incredibly grateful! Just a note - I'm not saying that Groups of friends can only have one cool person and the rest are wannabes. Greatness attracts Greatness, so there can totally be more than one really cool person in a group! I know this can be a controversial topic and this is just my opinion - for what it's worth, but I would love to hear your take on this? 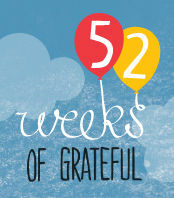 And because I am grateful for the Truly Cool people in my life, I'm gonna go and link this post up to the Truly Cool Bron's - Maxabella Loves - 52 weeks of Grateful.